Keepsake ornaments are the perfect way to take a trip down memory lane while decorating the tree each year. 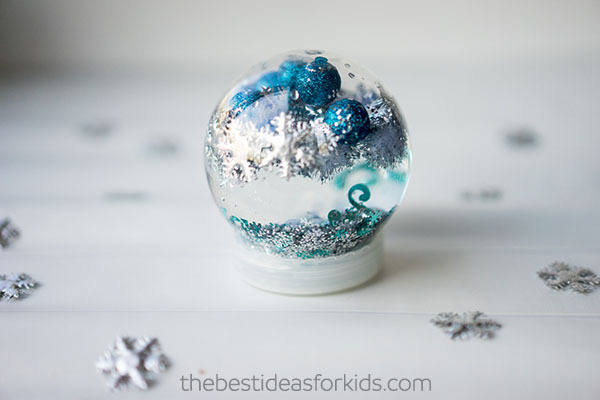 These little DIY snow globe ornaments are so sweet when filled with some kids’ artwork and faux snow. 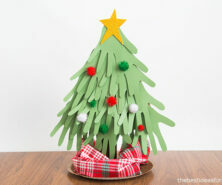 They are adorable hanging on the tree and would also be a great gift for Grandparents. 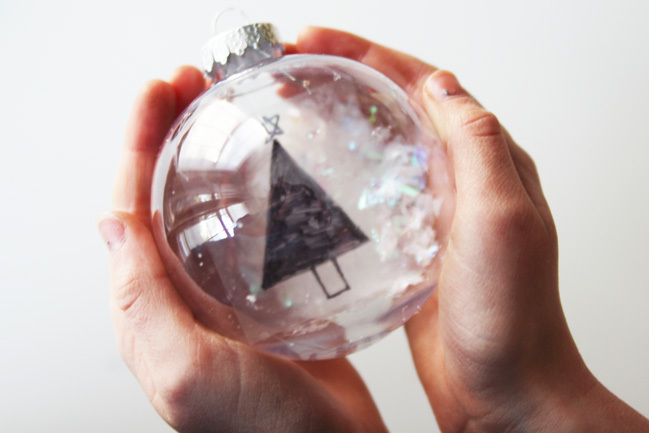 A lot of DIY snow globes are beautiful but are not the most kid-friendly to create. 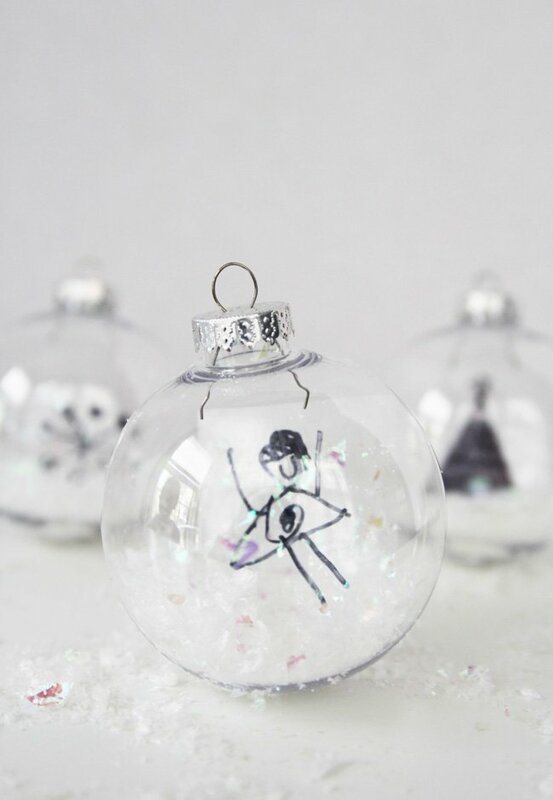 These snow globe keepsake ornaments are unique because even small children will love helping to create the art and filling the ornaments with faux snow! They couldn’t be easier to put together! 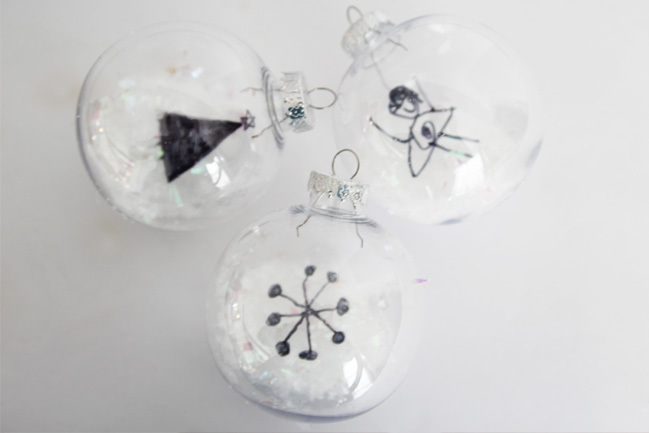 We love these DIY snow globe ornaments because all of the materials can be easily found online or at your favorite craft store. 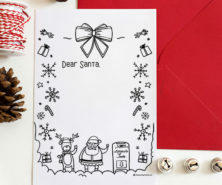 Get started on them now so that you have some to give away this Christmas season! 1. Begin by cutting your piece of vellum or plastic into a square or rectangle that is about the same width as the ornament. Vellum is a semi-translucent paper that can be found at most craft stores. If you can get your hands on some plastic sheets, that works great too! We actually used some leftover plastic that originally had stickers on them. 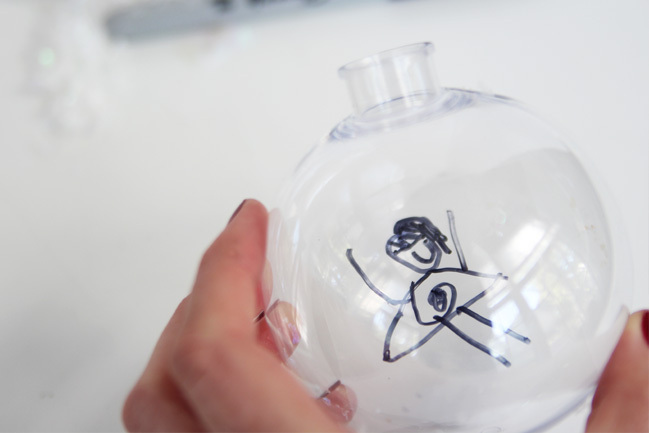 Now draw your picture with the black sharpie or use colored sharpies too! 2. 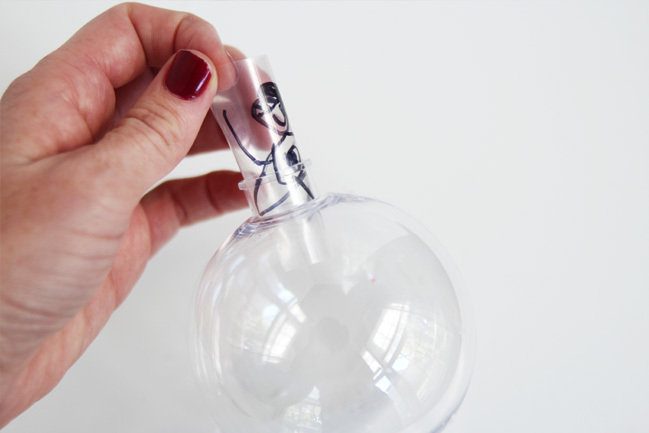 Roll up the drawing and stick it through the opening in the top of the ornament. 3. As the plastic or vellum falls into the ornament, it should unroll and open up. If you need to, you can use a pencil to stick through the hole and adjust the paper as needed. 4. Fill the bottom of the ornament with faux snow. 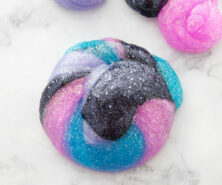 Kids will love to help with this part! 5. Secure the top back on and enjoy! They are such a unique take on the traditional keepsake ornament! 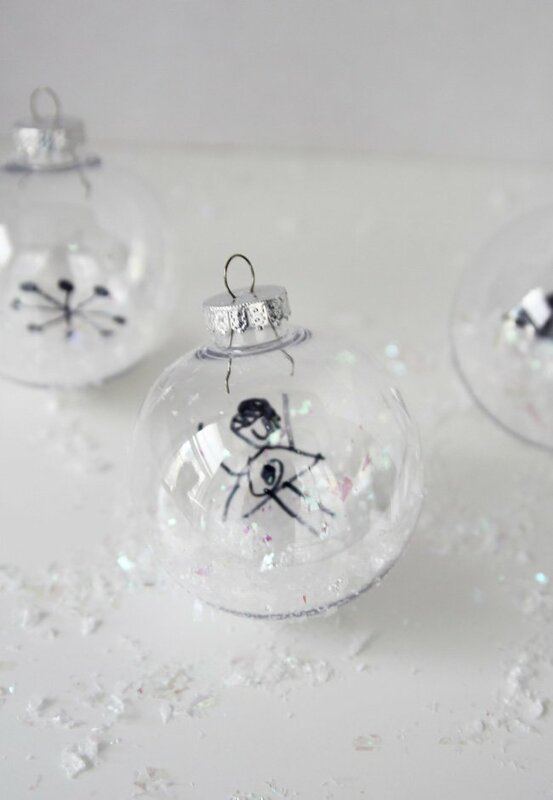 Try these with colored Sharpies or you could even write names or dates on the outside of the ornament as well! 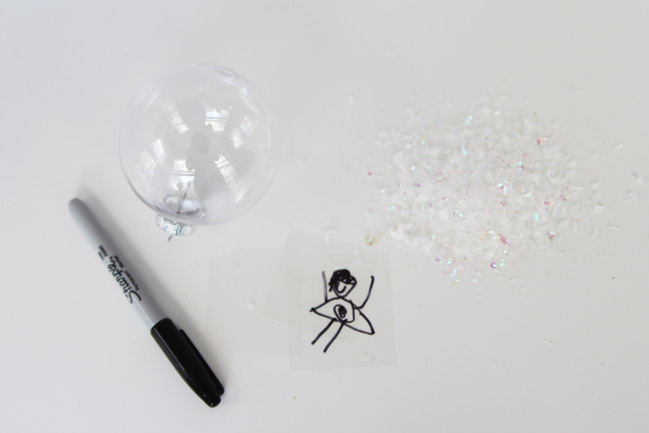 And if you like these DIY Snow Globe Ornaments, then this DIY Snow Globe Sensory Bottle may be for you! 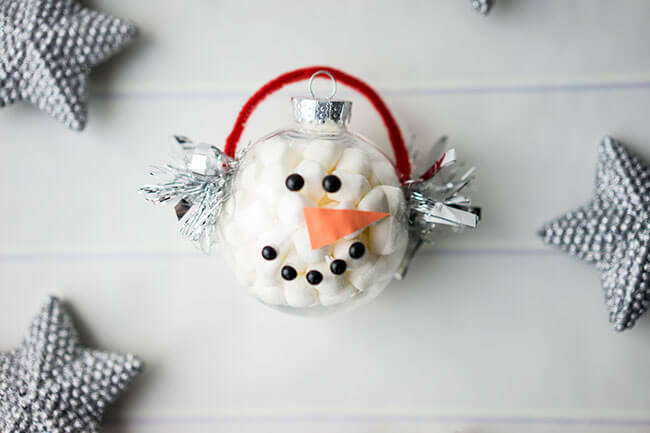 And another adorable DIY ornament idea that kids can help make are these marshmallow snowman ornaments. 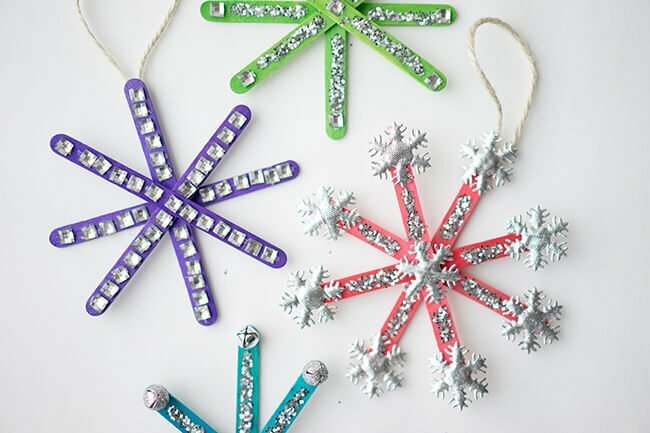 Finally, these popsicle stick snowflake ornaments are really easy to make too! 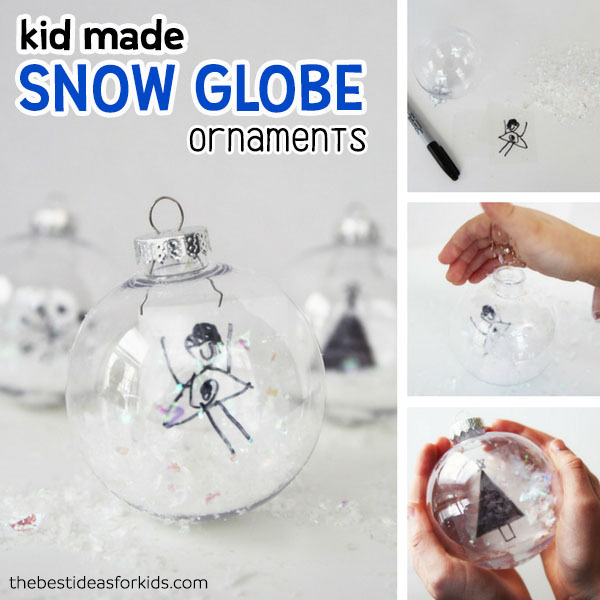 Kids will love decorating these for the Christmas tree.